The US economic outlook continued to improve in April as The Conference Board Leading Economic Index (LEI) rose +0.4%, compared to a +1% increase in March and +0.5% in February. The Lagging Economic Index increased by +0.2%, compared to +0.7% in March and +0.2% in February. Ken Goldstein, another Conference Board economist, explained that the LEI has remained positive despite abnormally harsh winter conditions which virtually brought the economy to a standstill. During the first quarter of 2014, the US economy grew by just +0.1%. Goldstein forecasts annual GDP (gross domestic product) growth nearing the 3% range for 2014 if consumers continue spending and businesses accelerate the pace of investment. The US LEI increased in April for the third month running. April’s gain was driven by positive contributions from building permits and the yield spread. Over the six-month period ending on April 30th, the LEI rose by +2.9% (approx. +6% annual rate), around the same pace as during the previous six months. The strengths among the leading indicators remain more widespread than the weaknesses. The Leading Credit Index (inverted). Manufacturers’ new orders for consumer goods and materials. Average consumer expectations for consumer conditions. Average weekly initial claims for unemployment insurance (inverted). Manufacturers’ new orders for non-defense capital goods excluding aircraft. The ISM new orders index. Stock prices remained unchanged in April. 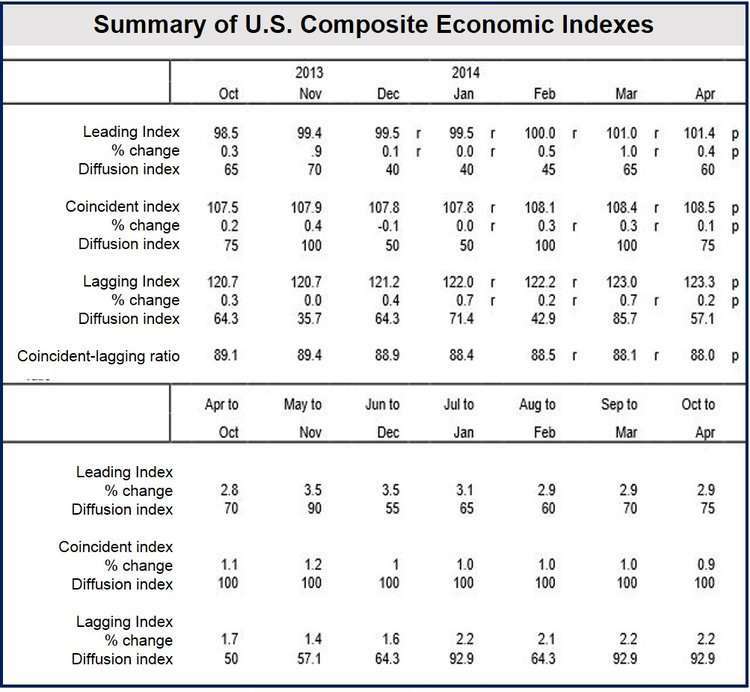 The US CEI edged up slightly in April. The CEI is a measure of current economic activity. The CEI increased by +0.9% (approx. +1.9% annually) over the six-month period ending on April 30th, 2014, slower than the +1.1% (approx. +2.3% annually) increase registered during the previous six months. However, the strengths among the CEI components remain very widespread. As the lagging economic index continued to rise more rapidly than the CEI, the coincident-to-lagging ratio was down slightly in April. Gross Domestic Product (GDP) grew at a +0.1% annual rate during Q1 2014, after a +2.6% increase in Q4 2013. Industrial production made a negative contribution. The CEI for April stood at 108.5% 92004=100). It had risen by +0.3% in March and +0.3% in February. US LAG for April stood at 123.3 (2004=100), with three of its seven components contributing positively. Commercial and industrial loans outstanding – UP. Average duration of unemployment (inverted) – UP. The ratio of consumer installment credit to personal income – UP. The ratio of manufacturing and trade inventories to sales – SAME. The change in index of labor cost per unit of output – SAME. Manufacturing and the average prime charged – SAME. The change in CPI for services – DOWN. According to revised data, US LAG rose +0.7% in March and 0.2% in February.